Is the Pathfinder Setting Ethically Problematic? I was seated pretty much facing this poster, so I pondered it a little bit. And if you squint at it, it looks like Europe and Africa. I’ve heard people say they think the setting is really creative, so I was surprised that it looked like a cliched Not-Europe. So, during a break in the game, I went in closer to take a better look. There’s different bubbles pointing at different areas, with a name and quick synopsis. I had a good laugh looking at the top half of the map. Scandinavia is huge, because clearly Scandinavia is METAL, and there’s a country of viking dwarf dragonslayers or something, which is pretty awesome, and a Transylvania/Ravenloft analogue, and something that looks like Grimdark France, and Romantic Spain in the middle of Europe, and Italy’s been taken and put off of Scandinavia, and to the east there’s some steampunk barbarian land, which is the only thing that seemed at all imaginative (but could possibly also be an analog for Czar Peter brings western technology to Russia). Anyway, it looked a little interesting. Still obviously Not-Europe, but maybe if it was rotated like 90 degrees, the comparison wouldn’t be so obvious. Then I looked at Not-Africa, and it wasn’t funny anymore. There’s seven civilizations in with text bubbles on the bottom half of the map. In the northeastern part of Not-Africa, we have “Osirion,” which is land of Pharoahs and Pyramids and clearly Not-Egypt. The Nile is clearly on the map. To the east, we have a Not-Arabia nation. These are direct historical analogues, much clearer and obvious than the ones in Europe which seemed to involve at least some imagination at first glance. There’s a nasty looking North-Not-African Nation, and an empire of (white) Liches on the East Coast. But mostly I am concerned about the three featured South Not-Saharan nations. One is on the west coast, and is a haven for pirates. One is in central Not-Africa, and is an empire of Talking Apes. One is in central Not-Africa, and is a war torn land of Gnolls. I don’t care much for words like cultural appropriation or political correctness, but it seems to me that if you’re doing stuff with other people’s cultural heritage, you should try to honor them. Thus, especially in the context of centuries of institutionalized abuse of Afrcian peoples by European ones, it seems particularly problematic that the people of central Africa (and therefore Black People in general) are depicted as either Pirates, Talking Apes, or Gnolls. It’s possible, I suppose that the setting isn’t actually that racist. Maybe there’s also really cool and empowering kingdoms peopled by Blacks. (I understand one of the iconic characters is a fully-clothed female black paladin, for which I thank Paizo.) But those nations either aren’t on the map, or don’t make enough of an impression compared to blatant stereotypes. Sure, Kingdom of the Apes is a classic Pulp Trope, but it features so prominently amongst an already cliched depiction of Africa. Maybe I’m wrong and there’s more to Pathfrinder’s setting than this. 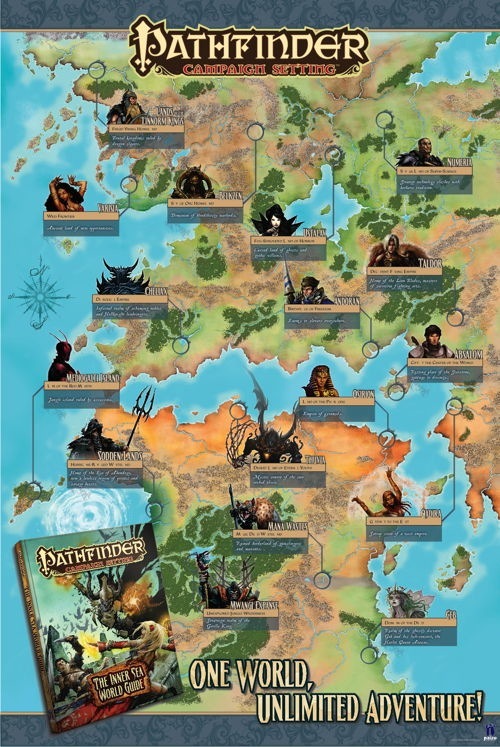 But if I am, then Paizo is doing itself a disservice by presenting it in this way.